Russian gas consumption in Europe continues to grow year after year, the market share of giant Gazprom last year reaching 35% in the European Union (EU). In Germany, Russian gas covered even 60% of national consumption. The energy war triggered by Russia, as a counterweight of sanctions imposed by the US and the West after occupying Crimea, has brought on Europe’s map new gas pipeline projects, initiated by Russia, but also by the EU. On the one hand, Russia – by extending its energy networks, is trying to keep the EU captive, and on the other hand the EU counteracts, through its projects, trying to reduce this reliance and diversify its supply sources. In this energy war, the iron embrace of Moscow translates for the EU into the new Nord Stream 2 project and TurkStream gas pipeline. The political stakes of the two gas pipelines for Moscow are obvious. In the North it is intended to remove Ukraine from the gas transit route to Europe and achieve a better interconnection with Germany, the main political and economic force in the EU space. In the South, it is intended to consolidate links with Turkey and expand to the Balkan states. In 2017, Europe imported 423.4bcm, of which 189.3bcm from the Russian Federation (45%), 109.2bcm from Norway (25%), 43.3bcm from the Netherlands (just over 10%), 33bcm from Algeria (almost 8%), 10.8bcm from the UK (2.5%) and smaller quantities came from Azerbaijan, Libya and Iran. Almost a quarter of imports (95bcm) went to Germany, which imports 48.5bcm from Russia and 20bcm from the Netherlands. The second place was held by Italy (53.8bcm, 12.7%), which brought half of the amount from Russia and the rest from Algeria and Libya; the third place was held by the Netherlands, which imported 40.9bcm, of which half from Norway. In Romania’s area, the largest importers are: Poland (14.7bcm – 11.1bcm from Russia and 3.5bcm from the rest of Europe), Slovakia (13.7bcm, entirely brought from Russia), Austria (8.6bcm, the entire amount coming from Russia), the Czech Republic (8.6bcm – 5.4bcm from Russia and the rest from Norway) and Hungary (8.6bcm, entirely brought from Russia). An amount of 65.7bcm was imported in Europe in the form of LNG, of which the largest amount came from Qatar (23.7bcm), Algeria (14.1bcm) and Nigeria (12.2bcm), Norway (4.8bcm) and the US (2.6bcm). Despite the obvious opposition of the US administration against the Nord Stream 2 project, as well as of other European states, headed by Poland, this project (whose foundation was laid in 2015, when Gazprom and a group of European companies, i.e. E.ON, Wintershall, Shell, OMV and Engie, signed an agreement for its implementation) goes further. In May this year, preparatory works started in Germany for the construction of the offshore section of the gas pipeline. With a length of over 1,200 kilometres, Nord Stream 2 will double the transmission capacity of Nord Stream 1, as of next year, to 110 billion cubic meters per year, so a larger amount of Russian gas will reach Germany directly via the Baltic Sea, without transiting Ukraine. OMV, Engie, Shell, Uniper and Wintershall, Gazprom’s partners in the construction of Nord Stream 2 gas pipeline, signed in April last year the project financing agreements. The five West-European companies have committed to grant a long-term financing of EUR 4.75bn, accounting for half of the project’s cost, each company following to contribute with an amount of up to EUR 950mln to pipeline construction. Gazprom, the sole shareholder of the project company, Nord Stream 2 AG, will cover the difference up to EUR 9.5 billion. The European Commission requested, last summer, a mandate from the EU Member States to negotiate with Russia on the Nord Stream 2 gas pipeline, to make sure that the future pipelines for Russian gas transmission to Europe complies with EU regulations. Washington has repeatedly warned that Nord Stream 2 would only increase EU’s energy reliance on Russia, although at declarative level the EU claims it wants to diminish it. Although it opposes this project, the US Administration will not sanction the European energy companies involved in Nord Stream 2 for their participation in the construction of the gas pipeline, US President Donald Trump has announced. US officials have repeatedly threatened, the last time as recently as a month ago, the five European companies, OMV (Austria), Wintershall and Uniper (Germany), Shell (UK and the Netherlands) and Engie (France) with the imposition of sanctions if they continued to cooperate with Gazprom in the construction of the gas pipeline aimed to diversify Russian gas transit to Europe, currently dependent on the Ukrainian route. The officials of Trump Administration believe that this pipeline would undermine the energy security and general stability of Europe, providing Russia with another tool for the political constraint of European countries and of Ukraine in particular. In an interview with Russian press at the end of July, OMV CEO Rainer Seele commented on US threats regarding Nord Stream 2, saying that all arguments against it were irrational, being mainly emotional political statements. He believes that the project has many opponents who accuse the pursuit of political objectives by building this pipeline. In reality, politicians who criticize this project are those who pursue their economic objectives, OMV CEO says. On the other hand, the implementation of this gas pipeline, whose construction is estimated at around USD 12bn, will generate for Ukraine losses estimated at approximately USD 2bn per year, representing transit taxes for gas supplied by Russia to Europe, analysts estimate. Moreover, Gazprom does not rule out the construction in the future of Nord Stream 3 gas pipeline, if Europe requests a higher gas volume, according to company’s Deputy Chairman, Alexander Medvedev. “We have proven reserves, we have transport, we are building new transport routes. If Europe expresses its needs and is ready to sign the necessary contracts, I won’t rule out the need for more new gas transportation projects such as Nord Stream 3,” Medvedev said in April this year in an interview with Rossiya 24. As far as the TurkStream gas pipeline is concerned, intended to supply Turkey with Russian gas via the Black Sea, it was 80% completed in late August, as Alexey Miller, Chairman of the Management Committee, Deputy Chairman of the Board of Directors – Gazprom, has stated. Worth USD 7bn, TurkStream pipeline will have a length of over 1,800km. The first line of the gas pipeline will provide the Turkish market with Russian gas, the second being intended for gas supply to countries in South and South-East Europe. The capacity of each segment is 15.75bcm of gas per year. The first gas deliveries are planned for the end of 2019. According to information provided in late August by project representatives, the route from Turkey to Europe will be implemented by a company to be established by Botas and Gazprom. Gazprom’s investments in the construction of this gas pipeline for 2018 are planned at around RUB 182.4bn (USD 2.9bn), compared to almost RUB 93bn (USD 1.49bn) in 2017. The Southern Gas Corridor (SGC) consists of four major projects: the development of Shah Deniz-2 field, whose reserves are estimated at 1.2 trillion cubic meters, the South Caucasus Pipeline (SCPX), which crosses Azerbaijan and Georgia, Trans Anatolian Natural Gas Pipeline (TANAP), which crosses Turkey, and Trans Adriatic Pipeline (TAP), which goes through Greece and Albania to reach southern Italy, via the Adriatic Sea. The Southern Gas Corridor, with a length of 3,500km, will deliver annually 6bcm of gas to Turkey and 10bcm to Europe. Having an estimated cost of EUR 45bn, SGC will be the first source of gas outside the Russian Federation. SGC is arguably the global oil and gas industry’s most significant and ambitious undertaking yet. And it is a complex challenge involving many different stakeholders – including seven governments and 11 companies. The Southern Gas Corridor is set to change the energy map of an entire region – connecting gas supplies in the Caspian to markets in Europe for the very first time. The pipeline system has been designed to be scalable to twice its initial capacity to accommodate potential additional gas supplies in the future. TAP gas pipeline construction is currently facing problems, after the Environment Minister in Italy, country which would be the end of line for the gas pipeline route, has stated that TAP project was pointless. With a length of 870km, Trans Adriatic Gas Pipeline (TAP) project will be the last section of the Southern Gas Corridor and will allow gas transmission from Turkey to Italy via Greece and Albania. Italy’s Environment Minister Sergio Costa has stated that Italy’s involvement in TAP project would be reviewed, together with other major projects. “TAP is on the table and we are looking at it as a priority. Given (our) energy policy, given falling gas demand, that project today looks pointless,” Sergio Costa said. The review procedure could create tensions between the Italian authorities and the other shareholders of TAP project, assessed at EUR 4.5bn. They include the British oil group BP, Italy’s Snam and Spain’s Enagas. TAP consortium has announced that changing the pipeline route outside Italy wasn’t an option, while changing the route on Italy’s territory could delay project completion by four to five years. The final section in Italy was to be completed in early 2020 and has already received all approvals from the Italian Government, including the environmental permit, in 2014. Over the past few years, gas demand in Italy has increased, but it is still below the peak level recorded a decade ago. Italy, country which imports over 90% of its gas demand, has major gas supply contracts signed with Russia, Libya, Algeria and the Netherlands, and the previous Government in Rome has announced its intention to create a European gas hub in Italy. In June this year, Turkey’s President Recep Tayyip Erdoğan, Azerbaijan’s President Ilham Aliyev and Georgia’s President Giorgi Margvelashvili have inaugurated the Trans Anatolian Natural Gas Pipeline (TANAP), an essential part of the future Southern Gas Corridor, which will diversify Europe’s gas supply sources and play an important part in ensuring Europe’s energy security. The pipeline, with a length of 1,850km, will carry gas produced at Azerbaijan’s Shah Deniz-2 field and other fields from the Caspian region, first to Turkey and then to Europe. The gas pipeline starts at the Georgia-Turkey border and runs to Greece; it will carry 6 billion cubic meters of gas to Turkey and 10 billion cubic meters to Europe. The total investment was USD 7.2bn, project partners being the Azerbaijani state-owned company SOCAR (51%), Turkey’s Botas (30%), UK’s BP (12%) and SOCAR Turkey (7%). Another section of the project, the Trans Adriatic Pipeline, will carry gas from Turkey through Greece and Albania to Italy, as of 2020. The operator of the gas transmission system in Poland, Gaz-System, and its Lithuanian counterpart, Amber Grid, have signed this spring an agreement to build a gas pipeline between the two countries, in the idea to integrate the gas markets of the Baltic countries with those from the European Union, diversify supply sources and enhance security. The investment aims at the construction of a pipeline with a length of 357km on Poland’s territory, plus a section with a length of 165km on Lithuania’s territory. The two sections would become operational before 31 December 2021. The European Union, which has already granted financing of EUR 10mln for this project, which was classified as a project of common interest (PCI), would contribute with financing of EUR 266mln to gas pipeline construction, EUR 58mln for Amber Grid and EUR 208mln for Gaz-System. These funds would come from the Connecting Europe Facility (CEF). 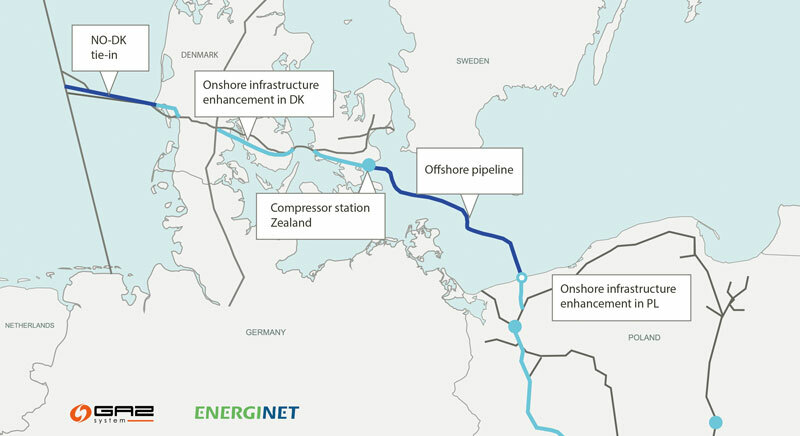 On the other hand, the operator of the Polish gas transmission system Gaz-System in June this year selected the preferred route for the future Baltic Pipe interconnector, a gas pipeline which would connect Poland to Norway via Denmark, amid efforts to diversify gas supplies. Gaz-System has accepted the route proposed by the contractor – Ramboll. The route will cover 275 km in total and will cross the territorial waters of Denmark and Poland, as well as the exclusive economic zone of Sweden. The route has two sites for landfall, Faxe South in Denmark and Niechorze-Pogorzelica in north-west Poland. Construction work on the pipe is planned to start in April 2020 and will last around two years, the gas pipeline following to be officially launched in October 2022. Once completed, Baltic Pipe will allow the transfer to Poland of 10 billion cubic meters of gas per year. Thus, for the first time, gas transmission from the Norwegian fields to the Danish and Polish markets, as well as to customers in the neighbouring countries, will be possible. The gas pipeline will also promote the objectives of the North-South corridor concept and the Baltic Energy Market Interconnection Plan (BEMIP), important priorities for the European Union in the field of energy infrastructure development. Poland and the Czech Republic are implementing a project consisting of increasing the transmission capacity of interconnection between the two states. 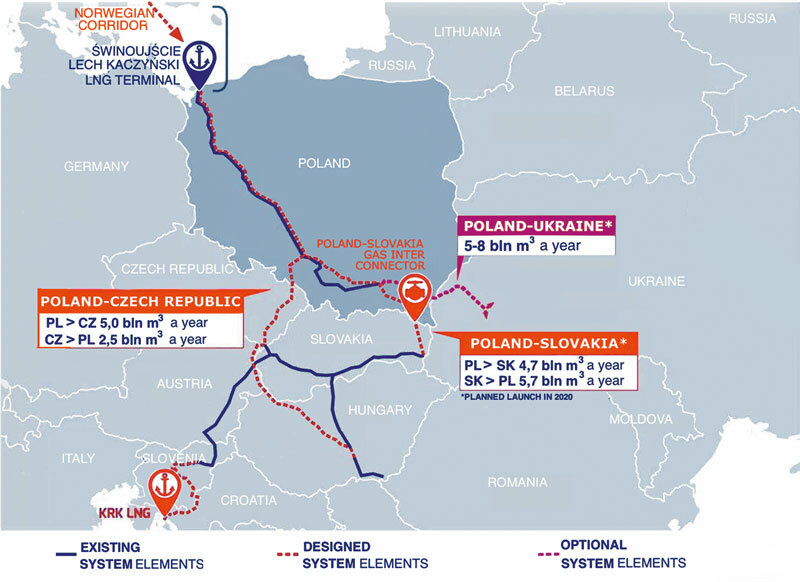 The project is an intermediary stage that will later allow interconnection on Tvrdonice (Poland) – Libhost (Czech Republic) route. Exporting gas from Poland using supply from the Świnoujście LNG Terminal and, in the future, also the gas mined from unconventional sources. Building an Austrian-Czech reverse flow interconnection on Baumgarten (AT) – Reintal (CZ/AT) – Břeclav (CZ) route is another project that was included in the list of Projects of Common Interest (PCI) of the European Commission. The Austrian and the Czech Transmission System Operators Gas Connect Austria and NET4GAS (project sponsors) plan to connect their pipeline systems and create additional transportation possibilities. The length of the planned pipeline is approximately 61 km (49 km on Austrian and 12 km on Czech territory) and is planned to cross the border nearby the village Reintal. Current planning foresees start of transport beginning in 2020. Bulgaria is also interested in the extension of TurkStream, the country launching a tender for a connecting pipeline with Turkey, thus trying to force Moscow’s decision to deviate the route to it and not to Greece. Also, Sofia would want to develop Balkan Gas Hub in the port of Varna, also being interested in purchasing gas from two Israeli sources, Tamar and Leviathan fields. The final decision depends on the completion of Interconnector Greece-Bulgaria (IGB), a pipeline worth EUR 220mln and with a length of 182km, between Komotini and Stara Zagora. Bulgaria and Greece have recently agreed to start the construction of IGB this year. Black Sea gas would reach Europe through BRUA gas pipeline. The project is financially supported by the EU and EBRD and would become operational next year. However, a dispute broke out between Romania and Hungary, on rights for Romania’s offshore gas and the volume of fuel to be delivered to Hungary via BUA. Hungary claims Romania endangers the energy independence of the entire region as it stalls gas extraction and, moreover, has decided to stop the construction of BRUA section leading to the Baumgarten gas hub in Austria. Budapest justifies its decision by the fact that the current interconnector with Slovenia is sufficient for gas transmission. Cyprus and Egypt have concluded an agreement allowing the construction of the first Cypriot subsea gas transmission pipeline, through the Mediterranean Sea, to Egypt, to be re-exported to Europe. “Today’s signing (19 September – Ed.) is an important milestone, not only for Cyprus but also the entire eastern Mediterranean region,” said Energy Minister Georgios Lakkotrypis after he signed alongside visiting Egyptian Oil Minister Tarek el-Molla. The pipeline will carry gas from the Cypriot offshore field Aphrodite (estimated to contain around 130 billion cubic meters of gas) to Egypt, which will transform it into liquefied natural gas (LNG). “We are essentially talking about a European pipeline, intended to transport Cypriot natural gas to Egypt for re-export to Europe in the form of liquefied natural gas (LNG),” said Lakkotrypis. US company Noble Energy in 2011 made the first discovery off Cyprus in the Aphrodite field (block 12). Block 12 is declared commercially viable, but its exploitation has not started yet. The Aphrodite consortium, which also includes Netherland’s Shell and Israel’s Delek together with Noble Energy, seeks to renegotiate the terms of the contract with the Cypriot Government before it taps the gas. According to the Cypriot Minister, this contract, the first of this type, will allow attracting investments worth several billion dollars in infrastructure construction. A joint committee will be established in the following days, in order to supervise this project, supported by the European Union. Italian company Eni has discovered another gas deposit southwest of Cyprus, but its size hasn’t been determined yet. ExxonMobil will begin a hydrocarbon search off Cyprus later this year. France’s Total is also licensed to search for gas. Currently, there are 28 large and eight smaller LNG terminals operational in Europe, in conditions in which last year alone three terminals were commissioned, two in Turkey and one in Malta. Regasification terminals in Europe show a balanced distribution along coastal Europe, most of which are located in the northwest and southwest. LNG terminals are installed in Belgium, France, Greece, Italy, Lithuania, Malta, the Netherlands, Poland, Portugal, Spain, Turkey and the United Kingdom. In 2017 the total regasification capacity of the 28 LNG terminals was 227bcm of gas, quantity ensuring approximately 40% of the European gas demand, according to an analysis of King & Spalding. In 2017 Spain’s LNG terminals accounted for the highest regasification capacity in Europe (6 operational terminals with a total combined capacity of 61.9 bcm/year, and a further terminal in hibernation with a capacity of 7 bcm/year), followed by the UK (3 operational terminals with a total combined capacity of 42.7 bcm/year) and France (4 operational terminals with a total combined capacity of 34.65 bcm/year). Two new European LNG import terminals are currently under construction in Spain (Tenerife and Gran Canaria) and with their commissioning the total regasification capacity of Europe will reach 230bcm of gas. It will grow significantly by 2021 as a result of commissioning of new terminals currently under construction. Many countries take into account or have already planned the construction of LNG terminals. Many of these import terminals planned are in the countries that already have functional regasification capacities. We are talking here about Greece, which has planned the construction of an LNG terminal in Alexandroupolis. Italy plans to build two additional terminals in Porto Empedocle, Sicily, and Gioia Tauro, Calabria. Poland wants to commission a terminal on the Baltic Sea coast. The UK has planned the construction of a terminal in Port Meridian and one in Trafigura Teesside. Also, Croatia will build one on the Krk Island, Cyprus in Vassiliko, Estonia in Tallinn and Padalski, Germany in Brunsbüttel, Ireland in Shannon and Cork, Latvia in Riga, and Romania in Constanta. Germany, Europe’s largest energy consumer, postponed plans for an LNG terminal of its own a few years ago, with major operators participating in foreign projects. A consortium comprising Dutch gas network operator Gasunie, German tank storage provider Oiltanking and Dutch oil and chemical storage company Vopak, is trying to get such a project off the ground. A funding decision by the consortium German LNG Terminal is expected by the end of 2019. Currently, Qatar Petroleum, the world’s top supplier of liquefied natural gas (LNG), is talking to German energy firms Uniper and RWE about cooperating on a potential local LNG terminal. “We have a serious interest in participating in a German LNG terminal and are talking to Uniper and RWE,” Saad Sherida Al-Kaabi – President & CEO Qatar Petroleum and Qatargas Chairman recently afirmed. Al-Kaabi mentioned there were two ways of participating in an LNG terminal, either by securing capacity to open up supply, or by taking a stake in the terminal infrastructure. Added to these are the LNG terminals planned for construction by countries outside the EU space such as Ukraine (in Odessa), Russia (in Kaliningrad), Albania (in Eagle) and Turkey (in Iskenderun and Saros). AGRI Interconnector project (Azerbaijan – Georgia – Romania Interconnector) was started in 2010 and aimed at the time to carry natural gas from the Caspian region, on the territories of Azerbaijan and Georgia, and crossing the Black Sea with LNG ships. The cost of AGRI project was estimated between EUR 1.2bn and EUR 4.5bn, depending on the capacity of terminals – between 2 and 8 bcm per year. The project involved the construction, on Romania’s territory, of a liquefaction terminal in Constanta. Once it reached Romania, LNG was to be regasified and carried further via pipelines to the rest of Europe. At full capacity, AGRI would have allowed the transfer of around 8 billion cubic meters of gas per year from the Caspian region to Europe, significantly reducing the continent’s reliance on Russian gas. Although eight years have passed since the launch of the project, so far it has remained only on paper. The project was proposed for financing to the European Commission but was not accepted, and now the shareholders have updated the feasibility study, trying to put it back on the agenda to obtain financing through one of the European facilities. US President Donald Trump in July this year told EC President Jean-Claude Juncker that US LNG supplies to the Old Continent would grow, in conditions in which it was intended to diversify supply sources. Given that at European level gas consumption has increased amid a reduction of production, imports went up and the US has become an option. But one quite expensive compared to gas supplied to Europe by Moscow. Americans are not competitive in this chapter: the price of LNG transported from the US to Europe would be twice higher than the price of Russian gas, according to Jonathan Stern, founder of the Natural Gas Research Programme at Oxford Institute for Energy Studies, and the US wouldn’t want to lower the price, as it would register losses. For now, the fact is that last year Russian gas supplies to Europe reached a record level.